English cucumber is one of my favorite,is sweeter and have thinner skin than other varieties of cucumber and they are nearly seedless.It's remind me a type of cucumber in Asian country. I use them so often to make this Indonesian acar timun very simple salad and perfect pair with any fried rice dishes. 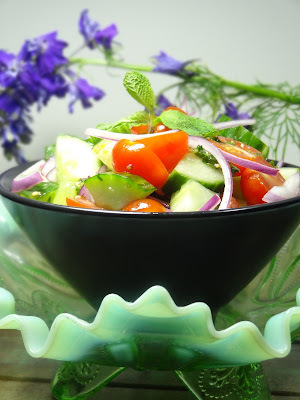 But in this cucumber and tomatoes salad,I try to mixed things up with other herb that I'm not familiar with,like "mint" I don't use mint much on my cooking. In the mixing bowl pour salad dressing toss and mix them together. This is a beauty. The colors are outstanding as is your photo. I really like that dressing with the sun-dried tomato oil. What a refreshing summer sald.